SHADES OF NAPA IN FALL WREATH Decorative Front Door Wreath is handmade on a sturdy vine base and filled with frosted berries and apples and nestled in grapevines and leaves. A stunning autumn seasonal decorative accessory to be used as a front door wreath or wall decoration. Measures 22-24 inches diameter and 7 inches deep. Made in USA with a 6 day production time. May be used outdoors in WEATHER PROTECTED AREA ONLY! Due to packaging and shipping, wreath may need to be fluffled before hanging. FRONT DOOR WREATH Hang this stunning fall wreath on a front door and guests will be welcomed with the beauty of falls changing colors. AUTUMN DECOR Filled with frosted berries and apples nestled in grapevines and leaves, this decorative wreath brings the beauty of fall color indoors when hung in a kitchen, living room, or above a fireplace. USE INDOORS OR OUTDOORS Adds a touch of autumn color when used as a decorative accessory for your fall home decor. May be used outdoors, but ONLY in a WETHER PROTECTED AREA. 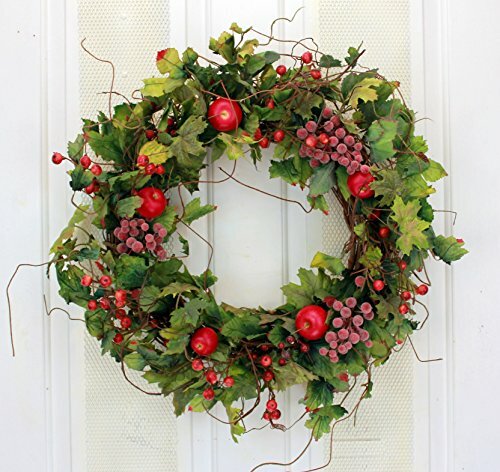 MADE IN THE USA Made here in the US of imported materialst this fall decorative wreath has a 6 day production time. PERFECT GIFT ITEM Makes an excellent gift for a birthday, anniversary, wedding, or housewarming. If you have any questions about this product by Wreaths For Door, contact us by completing and submitting the form below. If you are looking for a specif part number, please include it with your message.